In 1981 the School, through the inventiveness and enthusiasm of Wally Wallace in particular, organised and ran a relay from Whangarei to Wellington to mark in some way the School’s centenary year. The run was significant as it repeated the journey made by our Founding Father back in 1878 but it also had an underlying objective of raising some funds towards the cost of the new gymnasium. This was an achievement that surely will not be repeated and is one that must take pride of place in the School’s history. Not only was it a project of some magnitude purely when you consider that it involved teenagers running virtually the length of the North Island, but even more so from an organisational viewpoint which in today’s legislative environment would probably be too monumental to even get past the suggestion stage. 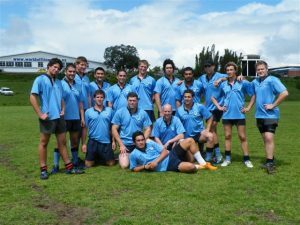 That it actually got past the suggestion stage just proves again the tenacity and ingenuity that has helped to shape boys at Whangarei Boys’ High School over the years. To recognise the feat, we repeat here the words from the 1981 Fideliter of the then Headmaster, Maurie Dean as well as Senior Master and head organiser Wally Wallace and Head Boy and relay runner Craig Waalkens. Also repeated are the words on the plague that was addressed to the Prime Minister. In 1981 we marked the memory of our Founding Fathers by running to Wellington and presenting a message of goodwill to the Prime Minister. In making that run we recalled the hardships our ancestors endured to get our School established. In all the preparations for that run the School displayed the spirit of Fideliter in a way that our Founding Fathers would never have envisaged. When the whole School lined up at Rugby Park and then ran through the city streets, when our representatives ran through the towns and countryside of North Island, when they finally assembled at Parliament Buildings and thanked the House for passing the Act which established the School — it was then that the dreams of our Forefathers came to full fruition. If this record survives 100 years I challenge the boys of Whangarei to repeat that journey in 2081. In that way the courage and the foresight of our Founding Fathers will always be remembered. The idea of a Centennial Run was conceived late in 1980 by our Headmaster, Mr Dean, as a means of raising $20,000 towards constructing a mezzanine floor in the proposed new Gymnasium. Planning for the run started during the second week of February 1981 and, like Topsy, the amount of organisation necessary to execute the plan just continued to grow. In a feasibility report to the High Schools Board during this early planning I set out two main objectives, namely to show our community the good presentation of our School and, of course, to raise money. Two committees were formed, a parents committee under the Chairmanship of Mr Graeme O’Neill, and a teacher’s committee under my chairmanship. It must be said right from the start, that the run could not have taken place without the service of the Parents Teachers Association committee. It was that committee, together with other parents, that were destined to provide most of the transport and drivers for the run, and in a number of cases, to use their personal contact with business firms in Whangarei to solicit substantial donations. For several reasons the run had to be made close to the end of Term One, ending one week before the actual Centennial Celebrations. Not least among the considerations that fixed this timing were weather and hours of daylight. It was because of the lack of term time after the run that sponsorship was sought in the form of a donation to the Gymnasium Fund, rather than sponsorship in its normally accepted sense. The boys of the school rose to the occasion on two main collecting drives in Whangarei and elsewhere, and the Seventh Form did a magnificent additional job collecting from business firms throughout the city. It was the boys of the School that collected over $16,000 out of a total cash figure of $23,000 and it was the boys of the School, of course, that did the hard work of running. The organisation of the run involved the provision of fund-raising administration, advertising, runners, escorts, time schedules, petrol, food, night stop accommodation, magazine articles, and a radio network so magnificently organised by Mr Ramsay and his colleagues in the Amateur Radio Operators’ Association. It also involved liaison with newspapers, radio stations, Traffic Departments, Civil Authorities, Publicity Officers, Mayors, Police and parents. In addition the departure and arrival ceremonies, together with a grand cavalcade through the city had to be planned and rehearsed. A multiplicity of detail had to be co-ordinated, the answer to one letter depending on another and so on, while time slipped relentlessly by. $930 was spent on providing paper, and Mrs Richmond did the gigantic task of typing countless letters, while Mrs Dean coped with piles of duplicating. On the bright Friday afternoon of 24 April I broadcast a description over Radio Northland of the colourful scene being enacted on the lower grounds of the School. Hastening from the radio station, dressed as a Town Crier in top hat and dress coat, and carrying a hand bell, I met the official party and lead them to the dais where I introduced His Worship the Mayor, Mr Ted Elliott, in the traditional manner of a century ago. While the dignitaries made their speeches I hurried into the city. The crowds of people waiting there were reportedly impressed with the spectacle to come. I announced the approach of the cavalcade at each street intersection with ringing bell and cries of “Oyez! Oyez!” Andrew Cann, on horseback, lead a horse-drawn wagon carrying ladies in period costume, who in turn lead the whole School including 20 teachers, as far as Tarewa Park. One teacher, John Rawson, trailed the cavalcade on horseback, and I feel it should be recorded that another teacher, Dave Scratton, who paced the running was a young 61 years old. At the head of the runners were Craig Waalkens, the Head Boy, together with his two deputies. They also continued with the relay team that continued from Tarewa Park to Wellington carrying a baton containing the Centennial message of goodwill and commemoration to Parliament. It was Andrew on horseback and the run itself that commemorated the reputed ride to Wellington of the School’s founding Father a century before, to entreat for the foundation of our School. During the run, which night-stopped at Pápakura High School, Otorohanga College, Slalom Ski Lodge, Lamberts Farm, Hunterville and Horowhenua College, Levin, the parents, runners and teachers infused into a truly ambassadorial unit, full of high spirits, camaraderie, and a sense of purpose. The highlight of the journey was the accommodation at the Slalom Ski Lodge, so generously donated by Southern Cross Tours Ltd. A magnificent log fire, pool table, table tennis and quiet comfort with real beds, restored the tired team to new vim and vigour, which sustained them for the rest of their journey. Radio Northland provided me with daily broadcast time to report on the progress of the runners, and to keep the fund-raising alive. As the team finally approached Parliament a mount was provided for Andrew to ride once again at the head of our exhilarated runners. Ten minutes before their arrival I sent a telegram through our communications network which read, ‘Our flag is flying high — be proud!” It was the spirit of this message that was felt by all of us remaining at school, and that spirit transmitted to our already exuberant team. Everybody concerned had risen to a great common effort, from which we discovered that the least of our reward was the raising of some $30,000 in cash and kind towards the Gymnasium Fund. The Centennial has had a large impact on this year’s events. Most certainly 14 of us will remember it as the year we ran to Wellington. After months of preparation, especially by Mr Wallace, the Centennial Run started from Rugby Park. Following the massed run by the whole school through Whangarei, 40 boys were left to battle on to Auckland. Most considered this the worst section due to the very steep terrain in places. After Auckland the numbers were whittled down again and 14 boys remained for the run to Wellington. Undoubtedly the climax of the adventure was our arrival at Parliament, being led in by Andrew Cann on a horse. Another feature, which was very evident throughout, was the spirit and devotion to the cause by everyone. It seemed as if Wellington was where we were headed and that nothing could stop us. The team arrives at Parliament led by a student on horseback. Wally Wallace’s proposal at the final 1980 staff meeting that the boys should run a relay to Wellington and Parliament to mark the forthcoming Centennial fell on mostly deliberate deaf ears. Except mine. I should have held my tongue. I didn’t. Before I could say ‘support crew’ I was on the team. Indeed at that point I might have been the team. Certainly though only hours later when my wife said “we should act as the catering crew” the team had grown to two. The School Archive holds the original handwritten menu suggestions and also Wally’s precise route and timing scheme, as well as much of the correspondence arranging overnight stops, permission to run through towns and cities. By April 1981 the trials had been made, the runners selected, the whole School had practiced the massed start and our car and trailer were overloaded with provisions. On the afternoon of April 24th the whole entourage: town crier, horseman, horses and open carriage, the formal relay team, all the boys of the School and even police cars departed the bottom field. The streets were closed and in short order the whole lot reached Tarewa Park. That evening the long distance team reached Waipu. A day later they were over-nighting at Papakura High School. The routines had been set, the stages were being run, the planning working almost to the minute. To Otorohanga, Raurimu, Ohingaiti, Levin and finally seven days almost to the hour after setting out, the fourteen boys together ran the final stage through Wellington to a reception on the steps of Parliament. It was a week which became an unforgettable benchmark in the lives of all those directly involved and an achievement unmatched in the history of the School. Running them? Cliff Brunker and Dave Scratton would plan the daily roster saying things like ‘Lets run them’ or ‘We will run them..’ or ‘If we run them..’. Well they did run them and they ran well. Rain, hail or shine, up, down, fresh or fagged out. Will the School ever see the like again? Now how about in 2031? More than 100 years ago our Founding Father made the long and tedious journey from Whangarei to Wellington to lobby members of Parliament to establish secondary education in the North. The result of that journey was the passing of the Whangarei High School Act in 1879. Today we who have inherited the school and the traditions established under that Act return to Parliament so that we can express our gratitude for the educational opportunities which we enjoy, opportunities which must go beyond the wildest dreams of our for bears. Throughout 100 years our motto has been “Fideliter”, a word which reminds us to be loyal to our task. We would like to think that so many who have passed through our School have served their country in the true spirit of our motto. This has been evidenced in the numbers who gave their lives in wartime and also in numbers who have served their communities and the nation in every facet of civil life – even to the highest position in our Government. We ask you, Sir, to accept this message of gratitude from our School. With it goes the pledge that we who have inherited the Fideliter motto shall remain loyal to the tasks that lie ahead and shall continue to take a pride in our School and in our Nation. Thank you for the splendid address which you and your head prefect, Craig Waalkens, have sent me. It is a fitting memorial, I believe, to your centennial run from Whangarei to Wellington. The stamina and endurance shown during that run reflects, I believe, the strength and fortitude shown by the school during its first one hundred years. I am reminded, too, by the address that your motto is “Fideliter”. This is an admirable expression of the school’s spirit. Loyalty to the task is a worthwhile objective; it summarises what I believe are the necessities of life today. I shall keep your address as a valuable record of your centenary and the run. The spirit in which your founding father made his historic journey to Wellington is as strong as ever. I commend the school, its masters, prefects and boys and wish it well as it commences its second century.